Adequate intake of vitamins and minerals is key to optimal health. But, since it is virtually impossible to eat enough food to get all the nutrients the body needs on a daily basis, taking multivitamin supplements is the healthy alternative. That is why Life Extension developed Life Extension Mix back in 1983. However, some people are averse to swallowing the nine tablets per day recommended to get the maximum health benefits demonstrated in scientific studies. 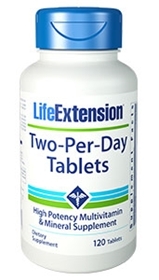 For those people, Life Extension has formulated a two-per-day multivitamin supplement that, although not as comprehensive as the Life Extension Mix formulas, provides the maximum amount of active ingredients that can fit into two tablets to confer some health benefits. A study published in JAMA demonstrated the health benefits of taking daily vitamins by pointing out “Most people do not consume an optimal amount of all vitamins by diet alone. Pending strong evidence of effectiveness from randomized trials, it appears prudent for all adults to take vitamin supplements.” The same JAMA issue, in its scientific review, reveals that inadequate intake of vitamins B6, B12, E, D, and folate are associated with less than optimal health. Other crucial nutrients included in the Two-Per-Day Tablets include biotin, which may be used as part of your diet to maintain a healthy blood sugar level in those already within normal range; lycopene, one of the most effective antioxidant nutrients; and lutein, a carotenoid that is beneficial to eye health. With relatively high amounts of folic acid, vitamin D3, zinc, lycopene, lutein, chromium, selenium, and B-complex vitamins, Two-Per-Day Tablets can stand up to any multivitamin supplement on the market. Two-Per-Day Tablets are an excellent choice for those seeking a premium-quality nutrient supplement that far surpasses off-the-shelf brands. Life Extension's mission is simply to help you live a healthier, longer life. They are at the forefront of medical research, constantly looking for ways to prolong youth, health, and life. They have been at it for more than 34 years, investing more than $140 million to find therapies and technologies that could lead to lifesaving cures for the diseases of aging. Life Extension insists on purchasing only the highest quality raw materials from all over the world, primarily from leading US, Japanese and European sources. They go one step further by using advanced analytical methods, such as high-performance liquid chromatography and gas chromatography/mass spectrometry, to ensure Their products meet label claims for potency and purity. Life Extension tests its raw materials using US Pharmacopeia and other exacting pharmaceutical assay standard. Other ingredients: microcrystalline cellulose, maltodextrin, stearic acid, croscarmellose sodium, magnesium stearate, silicon dioxide, pharmaceutical glaze. Contains soybeans. Contains corn and rice. This product contains NO milk, egg, fish, peanuts, crustacean shellfish, tree nuts, wheat, yeast, gluten, or artificial sweeteners. Take two tablets daily in divided doses with meals, or as recommended by a healthcare practitioner.